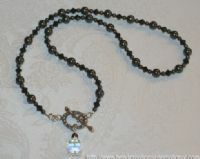 Beautiful Necklace with Black Swarovski 8mm Pearls and Black Swarovski 6mm Black Crystals. The Bali Toggle goes in the front where there is a Swarovksi Black Pearl, a Clear Crystal Roundelle, and a 12mm Square AB Clear Crystal hanging from the Toggle. If you want this necklace longer than 24" the price will be $3 per inch see below.